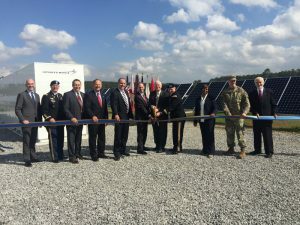 Not liking to do things halfway, the U.S. Army is going all in on renewables with a 10-MW solar microgrid-ready project, now in operation at the Redstone Arsenal in Alabama. Designed, built and operated by SunPower, the project also features a 1 MW energy storage system. The Army pursued the energy improvement to enhance energy resilience, reduce electricity costs and provide energy diversity. Operating under a 27-year power purchase agreement (PPA), the microgrid-ready facility offers all-green electricity at rates competitive with traditional energy sources, according to SunPower. The PPA eliminates a capital expenditure by the Army. Financing was provided by Regions Bank of Birmingham. “We’ve cost-effectively built a reliable, home-grown renewable energy project that is expected to deliver savings for decades, allowing us to invest more resources in protecting the nation and those we serve,” said Lt. Gen. Edward Daly, senior commander, Redstone Arsenal. The deal marks another in a growing number of microgrid-ready projects being announced. Such projects are designed to be easily transformed into a microgrid in the future. For the U.S. military, microgrids couple its clean energy goals with its need for energy security. The Army has set a goal to secure 25 percent of its needed energy from renewables by 2025, and install 1 GW of renewables on Army installations. This project is a collaboration between the Army Office of Energy Initiatives, Redstone Arsenal, the Army Corps of Engineers, and SunPower. It features a SunPower Oasis Power Plant system. The modular solar power block is engineered and built for compatibility with a future microgrid. The storage component is expected to reduce peak power-related demand charges for Redstone Arsenal. Redstone Arsenal’s new power system is expected to generate up to 18,000 MWh/year. 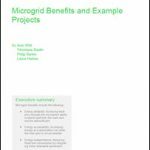 Track news about microgrid-ready projects as they are announced. Subscribe to the free Microgrid Knowledge newsletter.